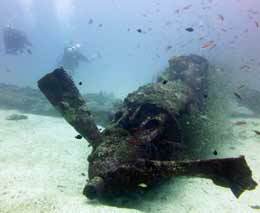 Diving Munda in the Solomons west is varied: a long accessible coastline, with a great many large natural reefs and walls and WW2 aircraft wrecks. 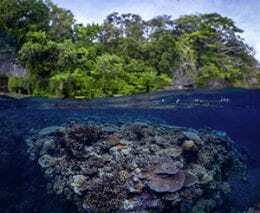 Munda itself is a friendly little township in the Solomons Western Province and should be considered for inclusion on any Solomon Islands scuba diving trip. It has an international-sized airstrip, a compact little town centre – you can walk from the airport to the public jetty in 4 minutes – and a variety of accommodation options. 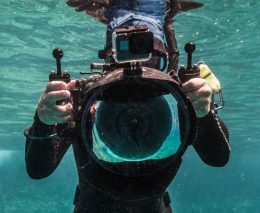 The main diving operation is Dive Munda within the Agnes Gateway Hotel, and it has two boats giving access to twenty plus dive sites on natural reefs and small wrecks along the coastline, with 20 to 60-minute boat ride. As well as the great diving, there are other things to see, including the renowned ‘Skull Island’, and do, including a relaxing sunset cruise. Munda is in the Western Province. 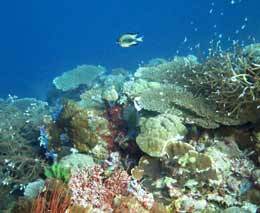 It lies between Seghe and Gizo. 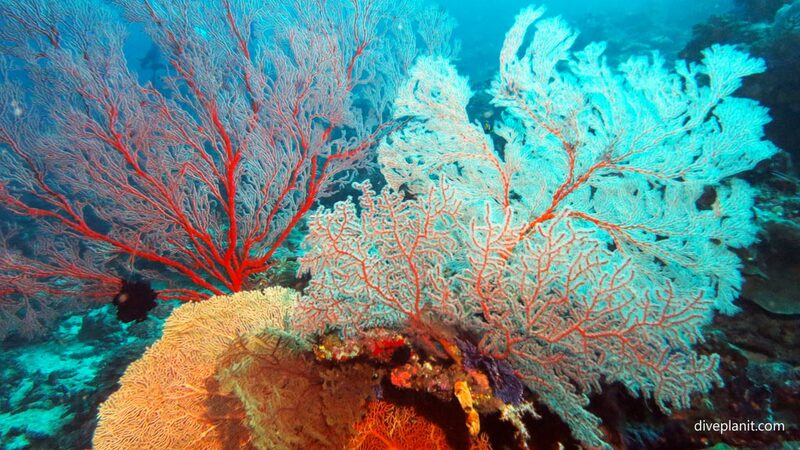 The main dive operation in Munda is Dive Munda, which is now part of the Solomon Islands Dive Expeditions (‘SIDE’) Group. It is based within the Agnes Gateway Hotel. Munda has a long accessible coastline, with a number of islands dotted along it. 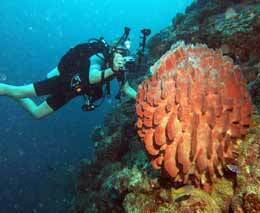 This means it has a great many large natural reefs and walls where the terrain slopes or drops from 5 to 30m. 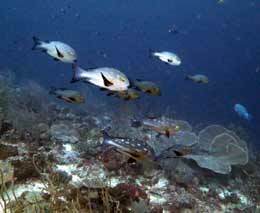 Most of these places – especially where they run to a point with a bit of current flowing around them – attract large numbers of fish and bigger fish! 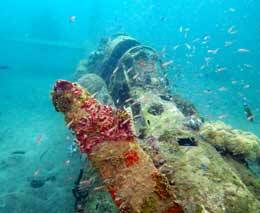 There are also a number of smaller wrecks scattered around – particular those of aircraft. 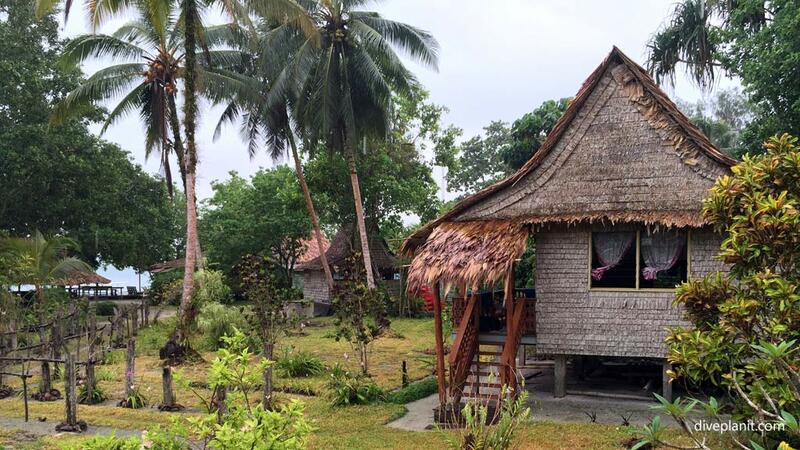 Agnes Gateway Hotel has 16 bungalows (or ‘Ibubu Cottages’), half a dozen singles rooms and some dorm rooms. It has a large restaurant but a much more pleasant place to dine is ‘Vetu Valusa’ (the fisherman’s hut), though actually it’s more of a covered dining deck that sits over the water and catches the all-important breeze. Unless the place is very full, which is usually not the case, there is no buffet style dining, everything is à la carte and cooked freshly to order. Zipolo Habu Resort provides a traditional style of accommodation, with all the bungalows having traditional reed mats, and balconies with a view of the ocean. There are six bungalows, two deluxe which have 24-hour power, and en-suite bathrooms, two semi deluxe which do not have a bathroom but do have 24-hour power, and two traditional bungalows which have no power when the generator is off and no bathroom. 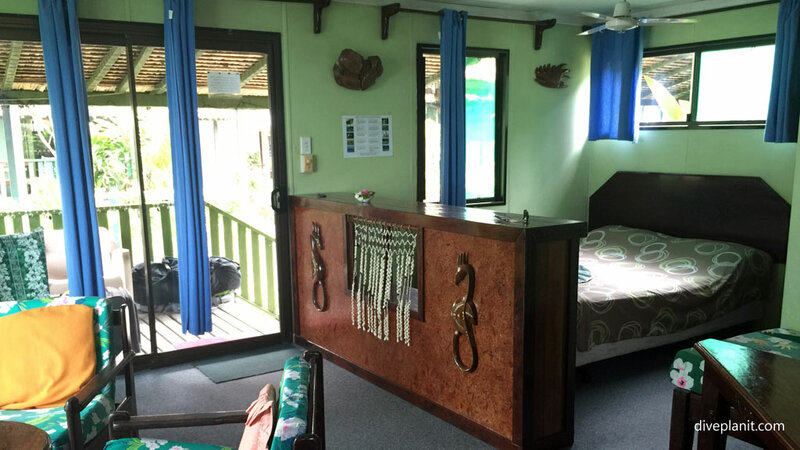 The beds have mosquito nets, and there is a fridge and a gas cooking ring supplied in each of the bungalows which means that families and groups can partly self-cater rather than eat all their meals in the restaurant. 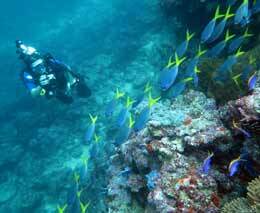 The island is close to the Shark Point dive site, and Dive Munda will pick up from here. The main activity of the guests at Zipolo Habu is game fishing, and there are fishing trophies and icons all around the bar and restaurant area. Qua Roviana offers a stylish medium-range to budget option for accommodation in Munda. 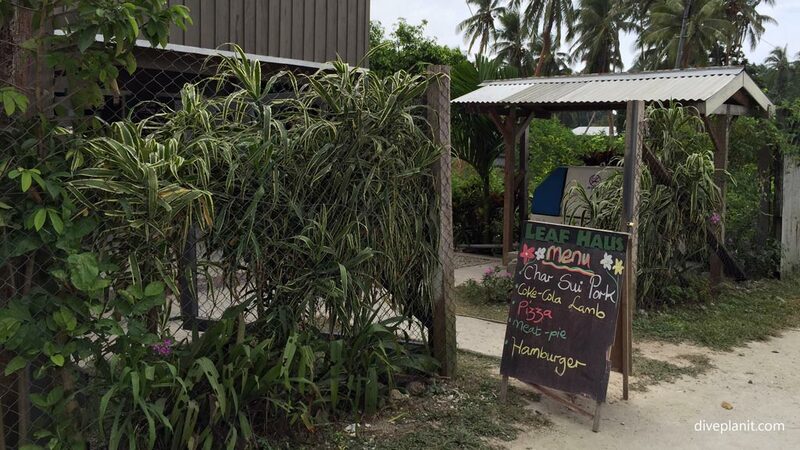 Conveniently located next to the fresh produce market, shops and a five minute stroll from the Munda airport. The large communal lounge area makes it the perfect long or short stay accommodation for students, divers and travellers alike. 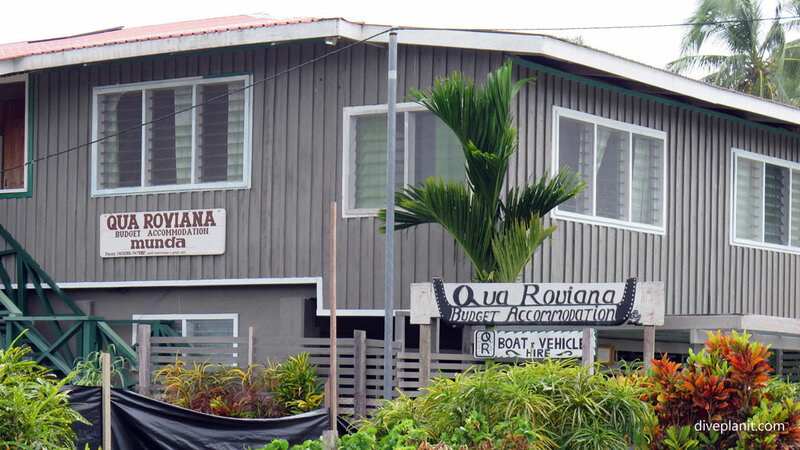 Agnes Gateway Hotel’s Bar Munda and Roviana Restaurant serve traditional Solomon’s meals with great reef fish curries. 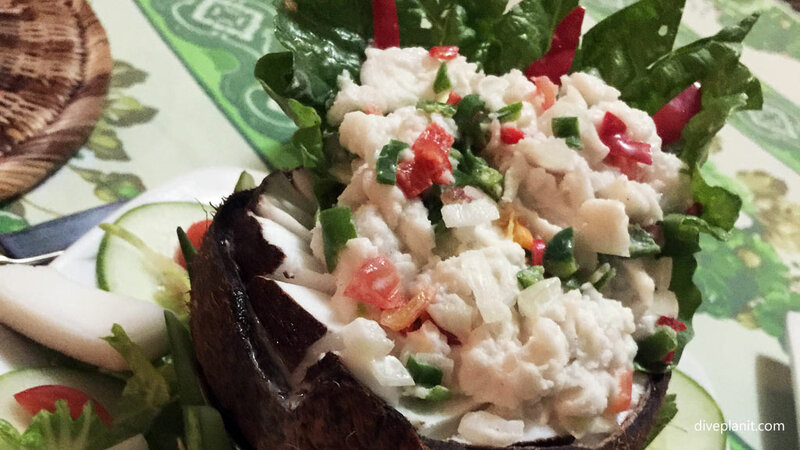 Also try their Kokoda: a Fijian idea with local ingredients. The other eating options are the Leaf House Cafe just over the road from Agnes Lodge. If you are in Munda on a Friday or Saturday evening check out the Cava Bar on the waterfront road, west of the market on the lagoon side of the road. They have authentic Cava (another concept recently imported from Fiji) in an authentic setting. Lambete Village, Munda is small enough to walk around. The public jetty, which is surrounded by the main accommodation and eating options is just a 5 minute walk from the airstrip. Most of the trips to other islands depart from this jetty. About a mile from the jetty, behind the sports field, a small museum has been built to house the various WWII items that have been discovered around Munda. 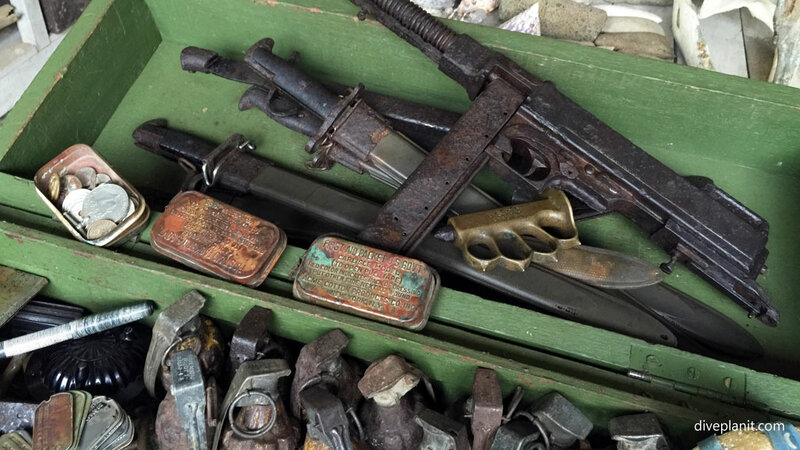 The museum has not just guns, grenades and shell cases, but also bottles, dogtags and some personal items from soldiers of both forces. 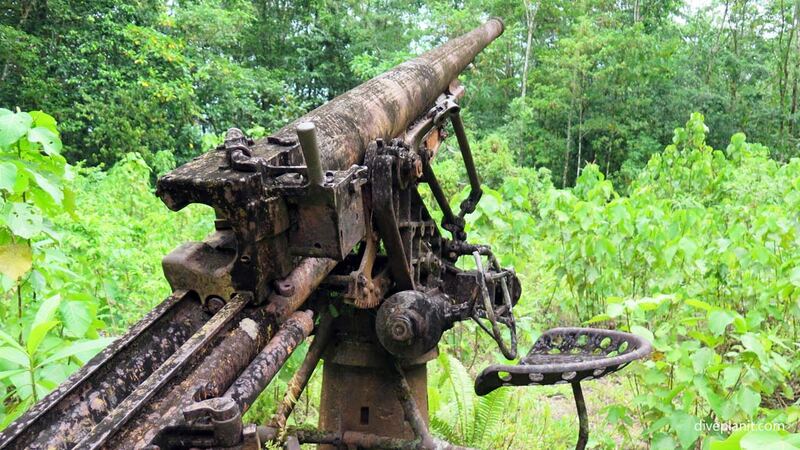 Along with the museum, if you are into WWII relics there are also the guns in the jungle, though you’ll probably need a local to direct you there. 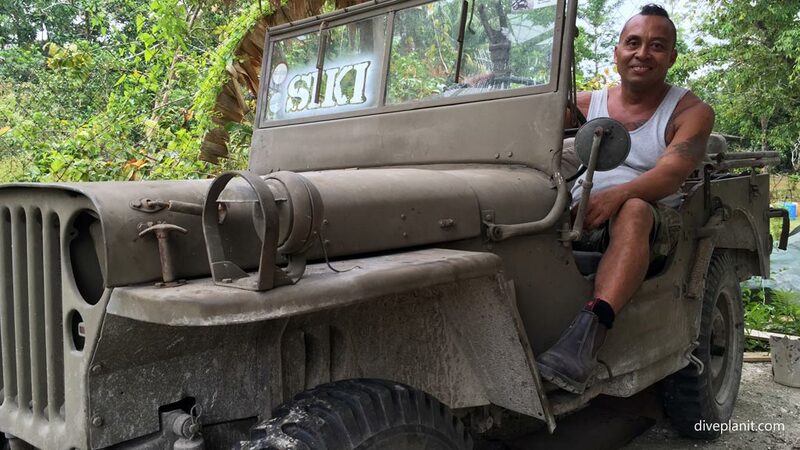 Another interesting WWII ‘relic’ is an American Jeep that Alfie Rex Lay, a professional restorer, has rebuilt from various parts that he has literally found in the bush. Combined with a few new parts, like the spark plug leads, he has reconstructed a fully working Jeep. His hobby is to go off into the bush and scout around the known dump sites collecting, and in effect recycling, stuff from World War II. Before Christianity arrived tribes would simply invade another tribe’s island, kill and cut off a warrior’s head and take it back to their own island as a prize. 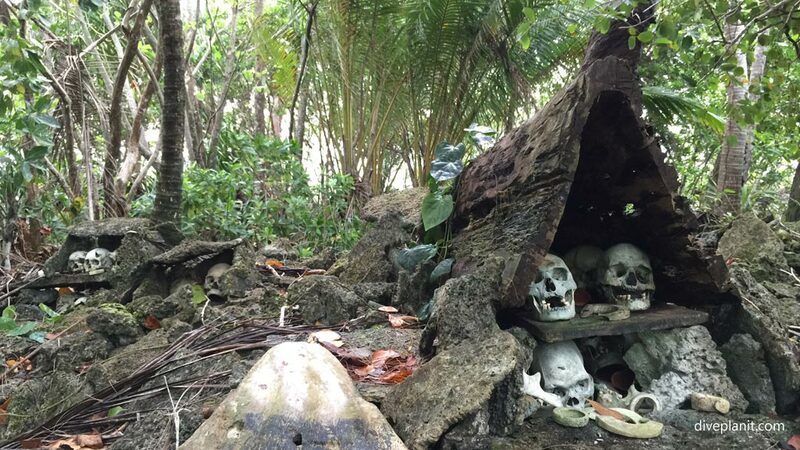 So on Skull Island there are graves, ancient and modern and skulls from headhunted warriors. They were brought here together after the 2007 tsunami which had its centre south of here. Fortunately it was more of a high tide event, not with a forceful wave, which would probably have destroyed all the villages and killed many of the inhabitants. The island is strictly taboo and nobody who has no business to be here should be here. There is one big mound in the middle with pockets of skulls in it and roundabout there are also the graves of certain chiefs. There are also three stones erected to the three spirits. These spirits are what will keep the fishermen safe when they are out at sea. There’s also a bowl at the entrance to the site which can be used to pay homage to the spirits and to flatten the water in the bowl will flatten the waters on the sea and make it safe for fishing. 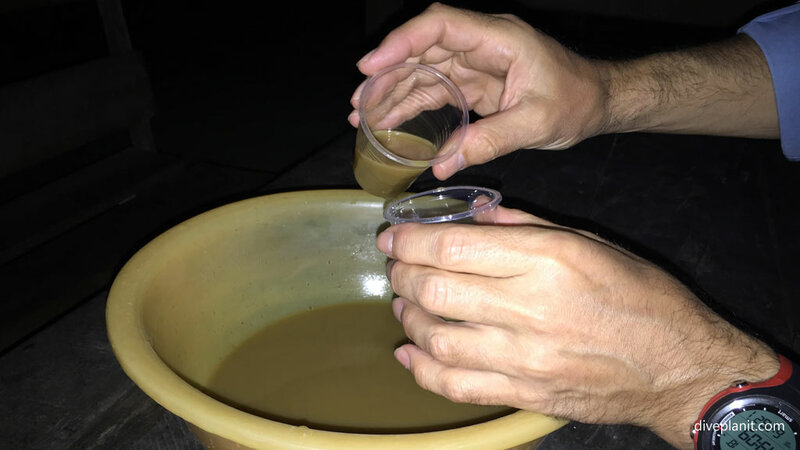 Conversely if your enemies are approaching you can whip up the water in the bowl and it will whip up the water on the sea to foil your enemies approach. Go West Tours, located just inside the gate at Agnes Lodge has a number of half and full day tours both on land and water. Agnes Gateway Hotel is right next to the main wharf, so expect a market to spring up right outside, especially on Saturday morning. 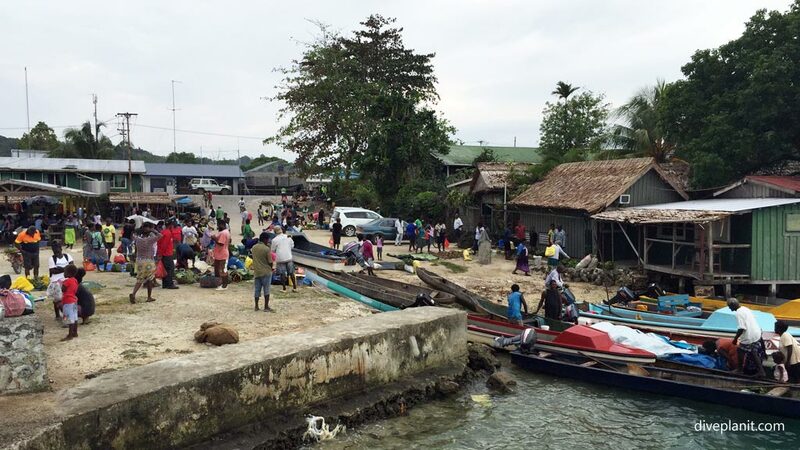 You’ll see the locals arriving in their long boats and produce from the different islands spread out for sale. There is at least one flight daily from Honiara to Munda return; two some days. 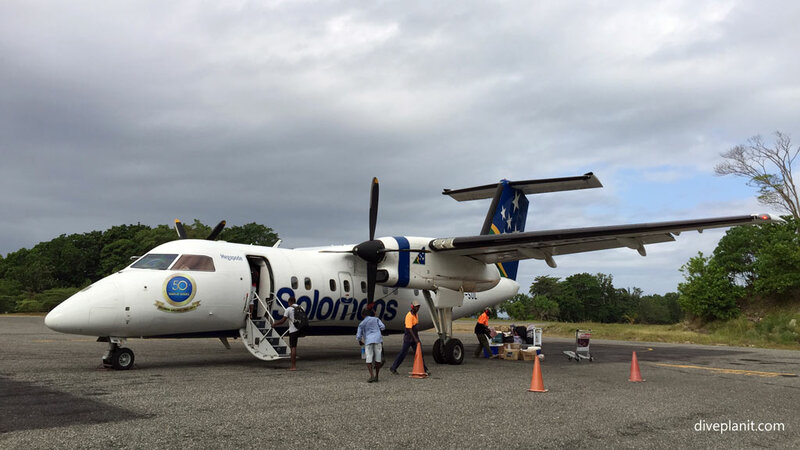 Some Gizo flights go via Munda, so from Munda you can also get to Gizo as well as Honiara. There is also a ferry that runs between Munda and Gizo which is much cheaper than flying (and doesn’t have the no-fly penalty) – but it doesn’t run every day, and sometimes runs only when enough passengers want to travel. Ask at your accommodation.